California's Great America (formerly known as Marriott's Great America and Paramount's Great America) is a 100-acre (40 ha) amusement park located in Santa Clara, California. Owned and operated by Cedar Fair, it originally opened in 1976 as one of two parks built by the Marriott Corporation. The park has appeared in 1994 films Beverly Hills Cop III and Getting Even with Dad and features over 40 rides and attractions. One of its most notable attractions, Gold Striker, has been featured as a top-ranked wooden roller coaster in Amusement Today's annual Golden Ticket Awards publication. Also featured is Railblazer, one of the first Raptor Track roller coasters in the World, and Flight Deck, a B&M invert coaster. Marriott's Great America, built by hotel and restaurant operator Marriott Corporation, opened to the public on March 21, 1976. Less than two months later on May 29, the company opened a second Marriott's Great America – later known as Six Flags Great America – north of Chicago in Gurnee, Illinois. A third park was initially planned for the Baltimore–Washington metropolitan area, but the idea was later abandoned after several failed attempts to sway local opposition. The park, though profitable, was still an earnings disappointment for Marriott, leading the company in 1983 to explore options to sell. An interested party, Caz Development Co., appraised the land value at US$800,000 to $1 million per acre. Marriott also involved the city of Santa Clara in negotiations, which was already leasing 55 acres (22 ha) of parking space for the amusement park. Fearing development of the land by Caz Development would aggravate already congested roadways, the city council approved a $101 million purchasing agreement on January 31, 1984, by a 4–3 vote that also had to be approved by city residents. The citywide vote passed, approving the sale by a margin of 3 to 1. Caz Development then sued the city and Marriott in the Superior Court of Santa Clara County to block the transaction. The court nullified the sale, forcing the city to attempt to salvage the deal through negotiations with the other parties. Unable to broker a timely agreement, the city council voted 6–1 to scuttle the sale on February 5, 1985, though the city was still interested in owning the park. After Marriott refunded a $20 million down payment back to the city, negotiations were restarted. All parties were able to agree on a compromise, which was signed in marathon sessions taking place in early June 1985. The city acquired the park for $93.5 million from Marriott, which retained 20 acres (8.1 ha) from the sale for development. Caz Development settled and was allowed to build a hotel and office near the park, which the city renamed Great America. Kings Entertainment Company, who owned and operated other amusement parks, was hired in 1985 to manage Great America for the city. In 1989, the city decided to return the park to the private sector and sold it to Kings Entertainment. In the agreement, the city would earn 5% of all revenue that exceeds $56 million. Logo used from 2003 until its sale to Cedar Fair. Three years later Paramount Communications (formerly Gulf+Western), the owners of Paramount Pictures, sought to join other entertainment companies as a theme park owner. The company acquired Kings Entertainment, owner of three parks including Great America, and one other park for $400 million and created Paramount Parks. Viacom, the parent of MTV Networks (including Nickelodeon), then bought Paramount in 1994, allowing Nickelodeon theming and merchandise into the park as well. During the Paramount era, attractions from the Action FX Theatre, Nickelodeon Splat City (later Nickelodeon Central), Drop Zone Stunt Tower, Invertigo, and many more modern thrill ride attractions were added in. Because the park is landlocked in the center of Silicon Valley, several rides including the classic train ride and the Sky Whirl, a Marriott's Great America signature attraction, were removed to make way for newer attractions. In its last years as a Paramount Park, Great America was co-owned with several broadcasting stations in the Bay Area, including KPIX-TV and KBCW. Logo used in 2006. This logo is still seen on the litter bins in and around California's Great America. After Viacom and CBS Corporation split, Paramount Parks became part of CBS. The merger did not last long, as CBS announced plans to sell the theme park division. Cedar Fair Entertainment Co. announced in May 2006 that they were acquiring the amusement park division from CBS. The transaction included licensing agreements with Nickelodeon and Paramount, providing the park the option to retain its Nickelodeon and Paramount theming for several years. On October 25, 2007, Cedar Fair renamed the park California's Great America. For the 2008 season, the park saw the addition of a Huss Rides top spin ride called FireFall, a new ice show in the "Great America Theatre" (formerly The Paramount Theatre), and the addition of the Halloween Haunt event to the park. In the summer of 2009, Cedar Fair announced that all the Nickelodeon themed areas would be replaced with Peanuts themed areas. In 2010, the newly rethemed Planet Snoopy opened in the park. On January 27, 2011, the park announced Invertigo would be removed and relocated to Dorney Park, another Cedar Fair property. On September 19, 2011, Cedar Fair confirmed reports that California's Great America would be sold to JMA Ventures, LLC for $70 million in cash. The sale required approval by the City of Santa Clara, and its city council was scheduled to vote on the matter on December 6, 2011. Cedar Fair, which purchased the park in 2006, expected to use the cash proceeds from the sale to reduce its senior secured debt. However, on December 6, 2011, JMA Ventures cancelled its plans to purchase the amusement park. In the same announcement, Cedar Fair also verified that a long-term agreement was reached with the San Francisco 49ers regarding parking and construction of a new stadium adjacent to Great America. Note: Number ratings assigned per California's Great America, while the colors are unique to Wikipedia. For more details, see the California's Great America "Guest Assistance Guide" (PDF). Archived from the original (PDF) on February 2, 2014. Retrieved May 14, 2013. Planet Snoopy is California's Great America's kids area, which opened in 2010. A time capsule was buried at then Paramount's Great America in the former KidZville area of the park on March 29, 2002. The time capsule is set to open on March 29, 2152. The time capsule reads, "At this site is buried a time capsule with essays by students in second through twelfth grades in the Santa Clara Unified School District and other local schools. What will the next 150 years in Santa Clara be like? In honor of the City of Santa Clara's sesquicentennial 1852-2002." Boomerang Bay is California's Great America's water park, opened in 2004 as Crocodile Dundee's Boomerang Bay. It is included with the price of admission to California's Great America. H.M.B. Endeavor: An Intamin Looping Starship that was removed after the 2017 season. Snoopy's Splash Dance: A kid's ride that was removed after the 2017 season. Logger's Run (ride): A Log flume ride that was originally located in All American Corners and closed after the 2017 season. Firefall (ride): A HUSS Park Attractions Top Spin flat-ride attraction that was originally located at the now abandoned Geauga Lake amusement park. The ride unexpectedly closed after the 2016 Halloween Haunt season. Vortex: A Bolliger & Mabillard standup roller coaster, was the second standup to be built by B&M. The ride was closed on Labor Day 2016 to be converted into floorless Patriot for 2017. Invertigo: An inverted Vekoma shuttle coaster, was North America's first inverted face-to-face roller coaster. It was removed due to reliability issues; topped by three breakdowns that made the news. The site was eventually used for RailBlazer Invertigo was later known as Stinger at sister park, Dorney Park, until its closure in 2017. Stealth: A Vekoma Flying Dutchman that was removed for construction of Boomerang Bay and relocated to Carowinds as Nighthawk. Great America Scenic Railway: A custom-built, 3 ft (914 mm) narrow gauge railroad around the perimeter of California's Great America. The roadbed can still be seen in many places. Great America Scenic Railway was rumored to have closed to make room for Hypersonic XLC, a coaster that was later cancelled and moved to sister park, Kings Dominion. Yankee Clipper: An Arrow Dynamics Hydro Flume that used to interlock with Logger's Run. Yankee Clipper was removed to make room for Stealth. Greased Lightnin': Originally The Tidal Wave, was a shuttle loop roller coaster manufactured by Anton Schwarzkopf. A model of The Tidal Wave exists in the park office. Skyhawk: An Intamin Flight Trainer that was rumored to be removed for its maintenance issues such as clear canopies on the cabins that would frequently fall off mid-ride. Sky Whirl: A Triple Tree Wheel supplied by Intamin, later known as Triple Wheel, then removed to make room for Invertigo. Lobster: An octopus/spider ride that was removed to make room for the Action Theater. Bottoms Up: A classic amusement ride known in the industry as a Trabant. Triple Play: A Huss Troika ride that was next to Vortex. Nickelodeon Central: A themed area containing rides, mascots, and attractions that were based on shows from Nickelodeon and Nick Jr. It was closed in 2009 and changed into Planet Snoopy. Whizzer: Originally named Willard's Whizzer, the original steel family roller coaster was made by Anton Schwarzkopf. Whizzer was removed because of maintenance issues and declining popularity. Gold Striker and Xtreme Skyflyer were eventually built on the site. Trolley Cars: In early years, Trolley Cars traveled in the Hometown Square area and other parts of California's Great America. Dolphin and Seal Show: During the Marriott era, dolphins and seals were kept to do daily shows. The show was removed when Paramount took over, and today it's now known as Peanuts Playhouse Theater. Smurf Woods: A Smurf-themed small kids area with small Smurf mushroom houses. Today, this area is now Planet Snoopy. Cajun Carpet: A large rotating platform ride located near the Orbit and Rip Roaring Rapids. Ameri-Go-Round: A PTC carousel that was removed for Drop Tower. Hilltopper: A classic Himalaya ride located just to the right of the Demon's entrance adjacent to the lift hill. Whitewater Falls' station roughly occupies the space now. Saskatchewan Scrambler: A classic Scrambler ride in the original Yukon Territory area, and later moved to the County Fair area and renamed Industrial Revolution. Fast Lane, first introduced at a Cedar Fair park in July 2011, is a secondary queue system that offers shorter wait times on the park's most popular rides. In addition to the standard admission charge, visitors can bypass the standard wait line by purchasing a wrist band that grants access to the Fast Lane queue. A limited number of wrist bands are sold each day. SCarowinds HAUNT XL The annual Haunt includes over 500 monsters placed in various haunted mazes and scare zones throughout the park. 2018: RailBlazer, one of the world's first Raptor Track Coasters by Rocky Mountain Construction. Halloween Haunt and WinterFest expansions. 2017: Patriot, a floorless conversion, repaint and re-theme of the park's stand-up coaster, Vortex. Halloween Haunt and Winterfest expansions. Sweet Tooth, funnel cake shop, FireFall, Logger's Run, H.M.B Endevour and Snoopy's Splash Dance are removed. 2016: A 4D holographic attraction themed to BioWare's Mass Effect video game in newly renovated Action Theater. Winterfest debuts. Halloween Haunt expansion. 2015: Planet Snoopy takes over the former KidZville section of the park. Halloween Haunt expansion. 2014: Flight Deck re-painted red and white, Grizzly Loading Dock painted red and white, Fun TV added to most rides, Grizzly re-tracked and new flooring in Carousel Columbia. Halloween Haunt expansion. Picnic Pavilion make-over and new entrance from the parking lot. All 6 Drop Tower cabins operating, and KidzVille Shooting Range removed for birthday party area. All Day Dining Pass and new food options added. Halloween Haunt expansion with more monsters, two new Haunted Mazes for 2014, and one new Haunted Attraction. Werewolf Canyon and Slaughterhouse: Annihilation mazes removed. The Overlord is removed as Haunt icon. Skeleton Key is added, giving 5 mazes a new interactive room. 2013: New Great Coasters International wooden coaster, "Gold Striker" added; Happy Feet: Mumble's Wild Ride in the Action Theater; Subway added, Halloween Haunt expansion. 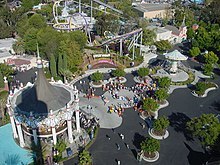 2012: Several park improvements such as a repaint of Carousel Columbia, Demon and Flight Deck. ADA improvements including an elevator lift entrance for Loggers Run and Vortex. Also, The Grizzly is retracked, Fast Lane. Construction commenced on Levi's Stadium, the new home of the San Francisco 49ers, in the former Great America overflow parking lot. Halloween Haunt expansion, Construction of 2013 attraction, Gold Striker (wooden coaster), in former Whizzer site. 2011: Invertigo is removed to be sent to Dorney Park; Three new live shows. Halloween Haunt Expansion. 2005: Boomerang Bay expansion to include lazy river, two other waterslides and a large swimming pool. 1995: Nickelodeon Splat City; The Edge and Ameri- Go Round are removed. 1992: KECO is acquired by Paramount, and renamed Paramount Parks; IMAX Pictorium Theater received a $1.5 million upgrade allowing it to screen 3-D films. 1991: Vortex; Saskatchewan Scrambler is removed. 1989: Skyhawk; Park is acquired by KECO from the City of Santa Clara; Dolphin and Seal show and Cajun Carpet are removed. 1985: Park is renamed Great America. 1984: Park is sold by Marriott corporation to the City of Santa Clara; management transfers to Kings Entertainment Company (KECO); Hilltopper is removed. 1983: The Edge; Red Baron and Ladybugs are removed. Though appearing under the name "Wonder World", Paramount's Great America was used as the theme park in the 1994 film Beverly Hills Cop III (itself released by Paramount Pictures). Writer Steven E. de Souza originally wrote the story as more "Die Hard in a theme park". He was told that each of the rides he had designed would cost about $10 million to build and the whole film would cost about $70 million. When box office results for The Distinguished Gentleman came in, Paramount ordered the budget to be cut to $55 million. Some modifications were made to the Columbia Carousel and Vortex roller coaster. Most of the Sky Whirl stunts were filmed in a studio. In this scene, George Lucas has a small part as the man Axel cuts in front of to get on the ride, also known as 'disappointed man' (this can be seen in the credits). The tunnels that supposedly ran under the park are a myth as well. No tunnels run under the park, as many thought after this was released. Many rides that were seen in the movie including Triple Play and the Sky Whirl have since been removed. Also, the carousel at the back of the park (the Ameri-Go-Round, not the Columbia Carousel) was altered. The Ameri-Go-Round carousel has since been removed and Drop Zone is now in its place. The ride featured in the rescue scene at the park was Triple Wheel (formerly known as Sky Whirl). Since the movie was made, the ride has been demolished and scrapped. 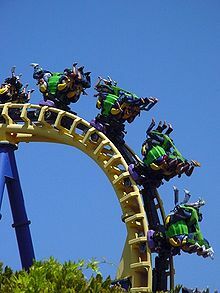 The Alien Attack ride featured in the Wonder World theme park was in fact the Earthquake: The Big One attraction from the Universal Studios Florida theme park in Orlando, Florida. The "aliens" featured in the ride are suited actors (and not animatronic as suggested in the film) that closely resembled the Cylons from the original Battlestar Galactica. Paramount's Great America was also used as the theme park Macaulay Culkin visits in the 1994 film Getting Even with Dad (not released by Paramount Pictures but rather Metro-Goldwyn-Mayer). 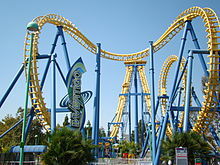 California's Great America was featured in a 2007 Excedrin commercial with the park's inverted steel coaster, "Flight Deck", as the main star. Marriott's Great America was used in the 1983 George Lucas and John Korty animated feature "Twice Upon A Time". It was used both as a background for animated scenes and for a short live-action shot at the end of the film. In 1980, a 13-year-old boy was killed and several others injured on the Willard's Whizzer roller coaster. In 1989, two boys intentionally jumped out of the Loggers' Run ride. One was killed and the other fell onto a platform and was injured. In 1991, two couples were injured on the Yankee Clipper as their boat hydroplaned then capsized, leaving the riders temporarily trapped under the upside-down boat. The attraction was later modified to include a bump at the bottom of the drop in order to prevent hydroplaning. In 1998, after riding Flight Deck, a 24-year-old Spanish-speaking man, who could not read the English-language warning signs, entered a locked, gated area underneath the ride to retrieve his hat. He was hit by the foot of a passenger on the Flight Deck train and later died. The passenger suffered a broken leg. In 1999, a 12-year-old boy fell to his death on Drop Tower after slipping from the ride's restraints, which were still locked at the end of the ride. On July 12, 2007, a 4-year-old boy drowned in the Boomerang Bay's Great Barrier Reef wave pool. On June 12, 2015, a maintenance worker was critically injured after being struck in the head by a moving train on Flight Deck. A passenger sustained serious hand and leg injuries in the incident. ^ "Photos: A look back at 40 years of California's Great America". San Jose Mercury News. March 27, 2015. ^ "Marriott to Sell Park to Bally". The New York Times. April 27, 1984. Retrieved January 24, 2013. ^ Flattau, Edward (August 19, 1977). "Marriott's high-powered approach". The Free Lance-Star. Retrieved January 24, 2013. ^ "A New Start At Great America". The Modesto Bee. Modesto, CA. June 20, 1985. Retrieved July 10, 2012. ^ "Firm Acquires Big Theme Park". Merced Sun-Star. Merced, California. June 6, 1989. Retrieved July 10, 2012. ^ "Press Releases :: Cedar Fair Entertainment Company". Cedarfair.com. Archived from the original on July 28, 2006. Retrieved 2012-06-04. ^ "EDGAR Filing Documents for 0000811532-06-000054". Sec.gov. June 6, 2006. Retrieved June 4, 2012. ^ "Cedar Fair to sell California's Great America park for $70 million" (PDF). Cedar Fair Entertainment Company. September 19, 2011. Archived from the original (PDF) on April 2, 2012. Retrieved September 20, 2011. ^ "JMA cancels $70M California Great America purchase". Business Journal. December 6, 2011. Retrieved December 7, 2011. ^ Young, Eric (December 6, 2011). "JMA drops plan to buy Great America, but 49ers stadium plans proceed". San Francisco Business Times. Retrieved December 10, 2011. ^ "Great America to remain with current owners; 49er stadium spat averted". The Examiner. December 6, 2011. Archived from the original on December 13, 2011. Retrieved December 10, 2011. ^ a b c d e f g Ratings assigned per California's Great America, where "1" is the least intense and "5" is the most. See their "Guest Assistance Guide" (PDF). Michigan's Adventure. Archived from the original (PDF) on May 22, 2012. for more specific details. ^ "RailBlazer". California's Great America. ^ Chavez, Jon. "Cedar Fair trying out 1st-in-line access fees". The Blade. August 6, 2011. Retrieved July 5, 2017. ^ "Fast Lane". California's Great America. Retrieved July 5, 2017. ^ "Fear is Waiting for You". California's Great America. ^ "California's Great America Halloween Haunt" – via Facebook. ^ "Great America Announces New Attraction Featuring Mass Effect Videogame Series for 2016". California's Great America. Retrieved September 30, 2015. ^ Zavoral, Linda (September 29, 2015). "Great America, Electronic Arts creating 'Mass Effects' attraction". San Jose Mercury News. Retrieved September 30, 2015. ^ "Off season tour and 2014 season details". Park Valley. March 8, 2014. ^ "49ers.com | Stadium Groundbreaking Slated for April 19". Blog.49ers.com. Archived from the original on June 25, 2012. Retrieved June 4, 2012. ^ Kaplan, Tracy (June 13, 2015). "Previous accidents at Great America". San Jose Mercury News. Retrieved March 15, 2016. ^ a b Rosales, Erik (July 12, 2007). "[Title lost before link went dead]". KGO-TV. Archived from the original on March 5, 2008. Retrieved June 4, 2012. ^ "Thrill ride lawsuits". Courier-Journal. June 23, 2007. Retrieved November 4, 2011. ^ "4-Year-Old Drowns In California's Great America Wave Pool – News Story – KNTV | San Francisco". Nbc11.com. Retrieved June 4, 2012. ^ Kaplan, Tracy; Nelson, Katie (June 13, 2015). "Great America roller coaster accident injures two people". San Jose Mercury News. Retrieved June 14, 2015. Michelson, Herb. (June 7, 1984). "City will purchase Marriott's". The Sacramento Bee, p. A. "Santa Clara drops Great America pact". (February 7, 1985). San Francisco Chronicle, p. 4. Ewell, Miranda. (June 6, 1985). "Santa Clara assumes ownership of Great America". San Jose Mercury News (CA), p. 8B. Kava, Brad. (March 15, 1989). "Great America reopens". San Jose Mercury News, p. 1. Eng, Sherri. (August 1, 1992). "Paramount to buy Great America owner". San Jose Mercury News, p. 1E. Wikimedia Commons has media related to California's Great America. This page was last edited on 9 April 2019, at 23:08 (UTC).